Ramsey Qubein absorbs the maze-like souks, Moorish mosques and bustling beaches of Morocco’s largest city. The west Moroccan port city of Casablanca is a whirlwind of frenetic traffic, aromatic scents and seaside breezes that wind through the streets of the busy metropolis. French influences blend seamlessly with Arabic culture, providing a feast for the senses. The largest city in the country, Casablanca is known ultimately as a commercial hub, but there is plenty to explore during a short sightseeing excursion between meetings. Start your tour at the Old Medina in downtown. Within walking distance of the city’s major business hotels and near Place des Nations Unies, this walled historic centre predates the French protectorate and now serves as a tourist attraction. It was partially destroyed by an earthquake in the 1700s but still showcases some of the city’s oldest structures. There are many things to see including Sidi Kairouani’s shrine, the burial place of the first patron saint of the city, and the Dome of Sidi Belyout. A small market at the entrance of the ramparts houses several shops, where the amusing process of bargaining for hand-painted tagines (the ceramic vessels in which Moroccan stew is cooked), a rainbow of babouche slippers and robes, and leather goods of questionable authenticity takes place daily. The colonial clock tower on the medina wall provides the perfect backdrop for photos, as does the waterside historic battery of cannons, which once protected the city from centuries-past invaders. After an hour of leisurely strolling, it’s time for some serious shopping. Take one of the city’s inexpensive red “petit taxis” (insist that the driver uses his meter) to the Habous Quarter, home to a souk where eager shopkeepers peddle their crafts, clothing, luggage, Berber carpets and souvenirs from line upon line of stalls. Haggling is accepted and encouraged. Beautifully arched doorways lead visitors into a maze of colourful shops with the odd ray of sunshine peeking through the roofs. The area is designed like a city, with stores filling in the spaces around a traditional mosque and old houses. While in the neighbourhood, be sure to take a peek at the Royal Palace, the Moorish 1920s exterior of which features colourful hand-painted tiles and horseshoe arches. With souvenirs in tow, hail another taxi to see the city’s main mosque, open to conservatively dressed tourists via guided tours several times a day, starting from 9am. (Entry is about Dh120/£9.) One of the biggest mosques in the world, it has a capacity of 25,000 people inside and 80,000 outside in the surrounding grounds. The Moorish-influenced structure sits on reclaimed land overlooking the sea, affording excellent views, and even has sections of glass floor that you can look through into the brine (the construction is related to a verse in the Quran that states “the throne of Allah was built on water”). The interior is ornamented in great detail with chiselled stone, carved and painted wood, and multicoloured tiles, while grandiose arched doorways add to the exotic feel. The mosque also has one of the tallest minarets in the world, at 210 metres, and from its pinnacle a laser beam directed towards Mecca can be seen for miles. 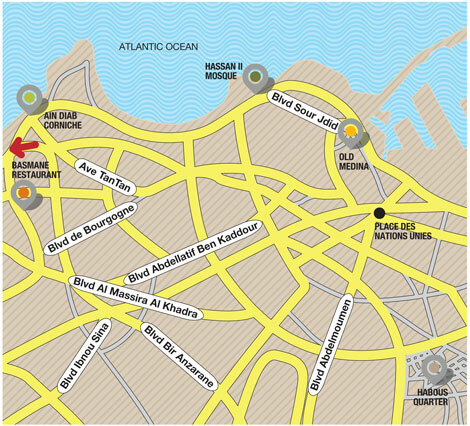 If people-watching is more your thing, head for the seaside Ain Diab corniche. (It’s best to take a taxi from the Hassan II mosque, which is in the vicinity but a lengthy walk away.) Locals come to the seafront to relax, have a bite to eat at one of the many cafés and fast-food outlets or visit the small shops. A new marina that’s under construction promises to bring even more modern conveniences to the area but, for now, the eclectic beachfront promenade is charming and authentic. Closer to the lighthouse, visitors can access the beach for a splash in the waves or take a dip in one of the many swimming pools on the strip – so bring your trunks or bikini if you think you’ll have time. In the evening, the area is popular with people out for a stroll after dusk or looking for a restaurant for dinner. And it really heats up after dark, when the nightclubs open their doors.